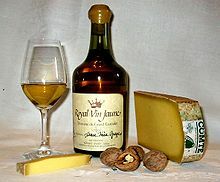 A pairing of Vin jaune with walnuts and Comte cheese. Wine and food matching is the process of pairing food dishes with wine to enhance the dining experience. In many cultures, wine has had a long history of being a staple at the dinner table and in some ways both the winemaking and culinary traditions of a region will have evolved together over the years. Rather than following a set of rules, local cuisines were paired simply with local wines. The modern "art" of food pairings is a relatively recent phenomenon, fostering an industry of books and media with guidelines for pairings of particular foods and wine. In the restaurant industry, sommeliers are often present to make food pairing recommendations for the guest. The main concept behind pairings is that certain elements (such as texture and flavor) in both food and wine interact with each other, and thus finding the right combination of these elements will make the entire dining experience more enjoyable. However, taste and enjoyment are very subjective and what may be a "textbook perfect" pairing for one taster could be less enjoyable to another. While there are many books, magazines and websites with detailed guidelines on how to pair food and wine, most food and wine experts believe that the most basic element of food and wine pairing is understanding the balance between the "weight" of the food and the weight (or body) of the wine. Heavy, robust wines like Cabernet Sauvignon can overwhelm a light, delicate dish like a quiche, while light-bodied wines like Pinot Grigio would be similarly overwhelmed by a hearty stew. Beyond weight, flavors and textures can either be contrasted or complemented. From there a food and wine pairing can also take into consideration the sugar, acid, alcohol and tannins of the wine and how they can be accentuated or minimized when paired with certain types of food. Wine has had a long history of being served as an accompaniment to food. The early history of wine has it origins as another dietary staple and a beverage that was often more sanitary than the local water supply. There is little evidence that much serious thought was given to pairing particular dishes to particular wines with most likely whatever wine was available being used. However, as culinary traditions in a region developed, so too did local winemaking tradition. Many pairings that are considered "classics" today emerged from the centuries-old relationship between a region's cuisine and their wines. In Europe, lamb was a staple meat of the diet for many areas that today are leading wine regions. The red wines of regions such as Bordeaux, Greece, Rioja, Ribera del Duero, Rhone and Provence are considered classic pairings with the lamb dishes found in the local cuisines of those regions. In Italy, the intimate connection between food and wine is deeply embedded in the culture and is exemplified by the country's wine. Historically, Italians rarely dined without wine and a region's wine was crafted to be "food friendly", often with bright acidity. While some Italian wines may seem tannic, lean or tart by themselves they often will show a very different profile when paired with boldly flavored Italian foods. There have been some historical anecdotes that have related to food and wine pairing before modern times. One anecdote often attributed to British wine merchants is "Buy on an apple and sell on cheese" meaning that if a wine tastes good when paired with a raw, uncooked apple it must be truly good and pairing any wine with cheese will make it more palatable to the average consumer and easier to sell. The principles behind this anecdote lies in the food pairing properties of both fruit and cheeses. Fruits that are high in sugar and acidity (such as the malic acid in green apples) can make wines taste metallic and thin bodied. In contrast, hard cheeses such as cheddar can soften the tannins in wines and make them taste fuller and fruitier. Another historical anecdote, still repeated today, is "White wine with fish; Red wine with meat". The root of this adage rests on the principle of matching the body (weight) of the wine with the weight of the food. Meat was generally heavier and "red" in color so it was assumed that a red wine (which was usually heavier than white wine) paired better. Similarly fish was generally light and "white" in color so it was often paired with white wine. This adage has become outdated somewhat due to the variety of wine styles prevalent in modern winemaking where there are now many "heavy" white wines such as "New World" oaky Chardonnay that can have more body than lighter reds such as Pinot noir or Italian Merlots. Another older idea was "to pair strong cheeses with strong wines," for example, asiago, a sharply flavored cheese, with zinfandel, a dark red wine with fruit tones. In hotels and restaurants, sommeliers are taught to recommend wine pairings to go with the restaurant's fare. In recent years, the popularity and interest in food and wine pairings have increased and taken on new connotations. Industries have sprung up with print publications and media dedicated to expounding on the principles and ideals of pairing the perfect wine with the perfect dish. In the restaurant industry, there is often a dedicated individual or staff of sommeliers who are trained to recommend wine pairings with the restaurant's fare. The origins of this recent phenomenon can be traced to the United States in the 1980s when the wine industry began to advertise wine-drinking as a component of dining rather than as just an alcoholic beverage meant for consumption and intoxication. Winemakers started to emphasize the kind of food dishes that their wines would go well with, some even printing pairing suggestions on back wine labels. Food magazines began to suggest particular wines with recipes and restaurants would offer multi-course dinners matched with a specific wine for each course. Gruner Veltliner is often made as a light bodied wine. After considering weight, pairing the flavors and texture can be dealt with using one of two main strategies — complement or contrast. The second strategy operates under the truism that "opposites attract" and brings together food and wine that have contrasting traits such as a crisp, acidic Sauvignon blanc and a fish with a creamy lemon sauce. The crisp acidity of the wine serves as a contrast that can cut through the creaminess of the sauce and give a different, refreshing sensation for the palate as opposed to what a complementary pairing, such as a creamy, buttery Chardonnay, would bring. For most of history, the "complementary strategy" was the prevailing thought on food and wine pairing. In the 1980s, as more people started to discover and experiment with pairings, the idea of using contrast started to gain more favor. It follows the same idea that the "salty/sweet" pairing does in cooking (such as salty peanut butter with sweet jelly). While it is often said that "taste is subjective", there are quantifiable taste characteristics (like bitter, sweet, salty or sour) that can be perceived and measured as low, moderate or high—such as measuring the sweetness of honey or the saltiness of oysters. Flavors, such as butterscotch, char and strawberry, are more personal and can't be quantifiable. Flavors are either perceived to be present or not. The perception of flavors is linked to our sense of smell, while tastes come from the sensory glands of the taste buds. Though individual sensitivity to the different taste "senses" can vary, wine experts will often recommend pairings based on these more objective measurements rather than the more subjective concept of "flavors". In wine there are three basic tastes-bitter, sweet and sour. These three tastes can each be identified with a primary component of the wine-tannins (bitter), residual sugar (sweet) and acidity (sour). A fourth component, alcohol, is identified in wine tasting with a perception of "heat" or hotness in the back of the mouth and is the primary factor influencing the body of the wine. The residual heat of the alcohol can be considered in food pairing with some ingredients minimizing the heat of the wine while some will accentuate it. Acidity is a dominant player in any food and wine pairing due to the pronounced and complex ways that it can heighten the perception of flavors. In wine tasting, acidity is perceived by a mouth watering response by the salivary glands. This mouth watering can also serve to stimulate the appetite. In wine there are three main acids that have their own associated flavors-malic (green apples), lactic (milky) and tartaric (bitter). In dishes that are fatty, oily, rich or salty, acidity in wine can "cut" (or standout and contrast) through the heaviness and be a refreshing change of pace on the palate. In cooking, acidity is often used in similar fashions such as a lemon wedges with a briny seafood dish such as oysters. The acidity of the lemon juices can make the oysters seem less briny. A wine that is less tart than the dish it is served with will taste thin and weak. A wine that comes across as "too tart" on its own may seem softer when paired with an acidic and tart dish. The complementing "tartness" of the food and wine cancels each other out and allows the other components (fruit of the wine, other flavors of the food) to be more noticeable. The sweetness of wines is determined by the amount of residual sugar left in the wine after the fermentation process. Wines can be bone dry (with the sugars fully fermented into alcohol), off-dry (with a hint of sweetness), semi-dry (medium-sweet) and dessert level sweetness (such as the high sugar content in Sauternes and Tokays). Sweet wines often need to be sweeter than the dish they are served with. Vintage brut champagne paired with sweet, wedding cake can make the wine taste tart and weak while the cake will have off flavors. In food pairings, sweetness balances spice and heat. It can serve as a contrast to the heat and alleviate some of the burning sensation caused by peppers and spices, e.g. in Thai or Sichuan cuisine. It can accentuate the mild sweetness in some foods and can also contrast with salt such as the European custom of pairing salty Stilton cheese with a sweet Port. Sweetness in a wine can balance tartness in food, especially if the food has some sweetness (such as dishes with sweet & sour sauces). The astringency associated with wine is usually derived from a wine's tannins. Tannins add a gritty texture and chalky, astringent taste. It can enhance the perception of "body" or weight in the wine. Tannins are normally derived from the skins, seeds, and stems of the grapes themselves (leeched out during the maceration process) or from contact with oak during barrel aging. Tannins react with proteins. When paired with dishes that are high in proteins and fats (such as red meat and hard cheeses), the tannins will bind to the proteins and come across as softer. In the absence of protein from the food, such as some vegetarian dishes, the tannins will react with the proteins on the tongue and sides of the mouth—accentuating the astringency and having a drying effect on the palate. Various cooking methods, such as grilling and blackening can add a bitter "char" component to the dish that will allow it to play well with a tannic wine. While fish oils can make tannic wines taste metallic or off. Astringent tannic wines like Barolo and Cabernet Sauvignon can overwhelm a lot of foods but can be softened by fatty foods with a lot of proteins such as hard cheeses or meats. The dry tannins also serve as a cleansing agent on the palate by binding to the grease and oils left over in the mouth. Spicy and sweet foods can accentuate the dry, bitterness of tannins and make the wine seem to have off flavors. Alcohol is the primary factor in dictating a wine's weight and body. Typically the higher the alcohol level, the more weight the wine has. An increase in alcohol content will increase the perception of density and texture. In food and wine pairing, salt and spicy heat will accentuate the alcohol and the perception of "heat" or hotness in the mouth. Conversely, the alcohol can also magnify the heat of spicy food making a highly alcoholic wine paired with a very spicy dish one that will generate a lot of heat for the taster. Beyond the basic guidelines listed above, food pairings can dive even further into matching several layers of texture and flavors. The term "bridge ingredients" refers to ingredients and flavors that have certain affinities in wine pairing (such as slow-cooked onions with creamy wines, etc.). It can also refer to using particular herbs and spices perceived in the wine (such as rosemary in some Cabernet Sauvignon) and adding them to the dish as an ingredient. Their presence in a dish may increase the likelihood that the certain wines will pair well. The above principles can be used for pairing wines with Asian cuisine. Pair for the flavor of the dish - whatever the 'main ingredient' may be - it is not the meat, seafood, or vegetables that stand out as the predominant flavor. Rather the true flavor of the dish is determined by the cooking method (for example, the toasty flavors of a stir fry), the sauce (from curries to sweet-and-sour), the use of seasonings (such as ginger and coriander leaves to mask fishy tastes), or the blending of ingredients to for new flavors (as in sukiyaki or satay). Indeed, it may result from a combination of any of these elements. Also, note that in the case of an Asian meal, several dishes are served at the same time and are shared by everyone present. The wine chosen for such a meal has to be versatile. ^ Engleman, Peter, "Say Cheese! ", New York Lawyer, January 2001, p. 14. ^ A reviewer at the San Francisco Chronicle wrote, "I want a nutty, slightly sweet wine with it, such as an oloroso sherry or a Madeira." Janet Fletcher, "Cheese Course: Hirtenkäse fans party when the cows come home," San Francisco Chronicle, February SF Gate website. Accessed March 17, 2009. ^ [unreliable source? ]iGourmet website. Accessed March 17, 2009. ^ Vidal, Stéphane; Francis, Leigh; Noble, Ann; Kwiatkowski, Mariola; Cheynier, Véronique; Waters, Elizabeth (2004). "Taste and mouth-feel properties of different types of tannin-like polyphenolic compounds and anthocyanins in wine". Analytica Chimica Acta. 513: 57–65. doi:10.1016/j.aca.2003.10.017. ^ Guy, P; Soon, E (2008). Wine With Asian Food. Tide-Mark Press. p. 1. ISBN 1-59490-114-7. Immer, Andrea (2002). Great Tastes Made Simple. Broadway. ISBN 0-7679-0907-0. This page was last edited on 8 December 2018, at 22:47 (UTC).